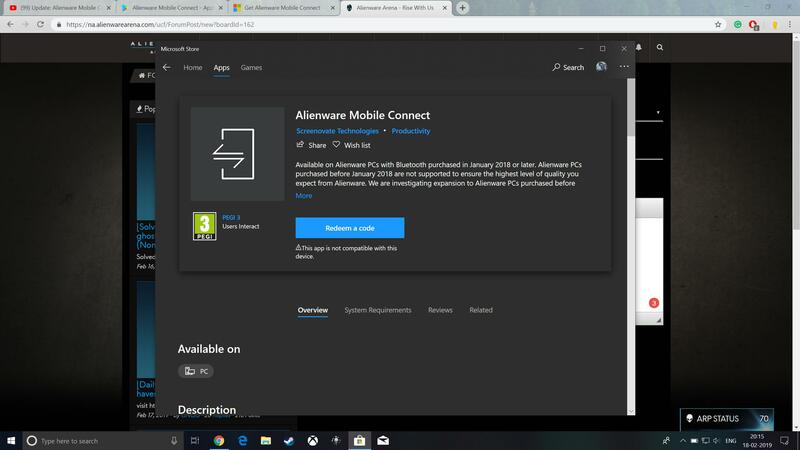 I have a AW 17r4 purchased in march 2018 and I cannot use the app. why does it say it is not compatible with this device where I find other people using it with their aw17r4? If so can I get a redeem code? Had the exact same problem a few days ago. Basically if you bought a machine before a certain date then it won't work on your systems. It was due to a licensing thing or something if I remember correctly when Frank said why it wouldn't work. You can follow these instructions and it will get it up and running if you want to spend a few minutes doing it. I have done this on my R4 a few times and it works well I just don't find I use it all that much. I contacted Dell support & they have a batch script that they run to correct the identification with the Windows Store. There is a Reddit thread in /r/Alienware that can walk you through it. Basically any system purchased before January 2018 wasn't eligible to get it, I believe due to licensing restrictions or something if I remember the AMA with Frank correctly. You can get around this using the instructions on Reddit and probably NBR and it will even update to the new version which mine did recently. Frank said they won't block people that chose this route but that he couldn't guarantee support for the older models or something along those lines. It is running on my R4 pre Jan 2018 right now, I just don't use it much. I literally did the same thing, but it gives me a non-compatibility error.